Dar Vander Hoop has been teaching yoga for 38 years. Dar immersed herself in dance as therapy at the University of Wisconsin where she earned a BS degree (with honors) in Psychology/Movement Therapy; and began her career as a performer/choreographer with Player’s of San Francisco; a touring dance/acting troupe. In San Francisco she studied under the auspices of Anna Halprin at San Francisco Dancer’s Workshop which eventually led her to explore yoga. Relocating to Los Angeles to pursue a show business career landed Dar right into the Hollywood scene, (70’s-80,) running between acting jobs, hobnobbing with the glitterati of that era, and inevitably standing on the carpet (no mats invented yet) in a 105-degree room at the infamous “Bikram’s Beginning Yoga Class," at The Yoga College of India in Beverly Hills, California. 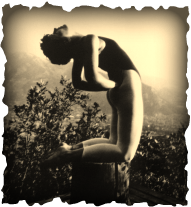 Moving into the 80's and instrumental in the west coast fitness craze, the 80’s yoga scene opened her career path. In 1984 Dar was on the cover of the LA Weekly after researching all of the yoga classes and variety of yoga schools in Los Angeles, which involved taking every yoga class offered within a 25 mile radius. She’s appeared on a variety of TV fitness shows, Good Morning America, her own talk show VanderHoop, Fass & CO.: and also modeled for photographers Robert Mapplethorpe, Lynn Davis, Howard Berman, Peter Kredenser, and Guy Webster. Dar appears throughout Bikram’s first book (the red edition!) In 1979, Dar briefly dropped out of the LA scene to reside at the Siddha Yoga Dham in upstate N.Y. with Swami Muktananda, and immersed herself in ashram life, chanting, seva, and meditation. Dar's logged thousands of hours under the great old school "real deal" yoga masters over three decades and continues to attend master cases and teacher trainings. Among some of her great teachers: Dharma Mittra, Swami Bhua, Indira Devi, Yogi Bhajan, Alan Finger, Bekir Algan, Bikram, Iyengar Institutes’ LA /NYC, Paul Grilley; and most recently attends workshops/ teacher trainings with Saul David Raye, Ashley Turner, Rolf Gates, Tias Little, Theresa Murphy, Mark Whitwell, Bernie Clark, Sarah Powers, Max Strom...to name a few. Winter 2014 Dar received her 50-hour teaching certificate in YIN YOGA with Bernie Clark at Semperviva in Vancouver, Canada. At Inner Fire Yoga, and Bliss Flow Yoga, Madison, Wisconsin, Dar is a senior teacher (12 yrs) and has been involved with teacher training. She travels nationally and internationally presenting classic Bikram, Vinyasa Flow, teacher trainings, Yin and Chakra workshops. Dar’s taught over 8,ooo yoga classes! YogaLove LLC includes a roster of workshops, classes and personal scent creations. GoodScents are small-batch aerosols, foot rubs and elixirs used in workshops and classes. Never defined by place, “brand”, studio, or societal expectations; among her roles: published writer, nationally syndicated “love” columnist (1994-1998), magazine publisher (LA WOMAN 1984-1986), fashion editor (Movieline Magazine), west coast advertising director Details Magazine, actress/model, single mother, TV producer/host, world traveler, courtesan to the rich and famous, ashram resident, dog lover, aroma therapist, caretaker, cook, chanter, bon vivant, and committed student to life and learning; a part of the ever-evolving human consciousness. Dar holds certifications in Bikram Yoga, 200 hr. from Inner Fire Yoga in Vinyasa, 50 hrs Yin Yoga (Bernie Clark), and a B.S.Degree, (with honors) UW Madison in Movement Therapy/psychology.